The HL-4570CDWT is a high-performance color laser printer ideal for small businesses or workgroups. Print your brochures, presentations or other business documents fast (up to 30ppm), and in brilliant color. This affordable printer features dual paper trays for a generous paper capacity of 800 sheets, wireless networking and automatic duplex for printing two-sided documents to help save paper. Also, optional high yield replacement toner cartridges are available to help lower your operating costs. Fast color output. With a print speed up to 30ppm in both color and black, you no longer have to wait for brilliant color output. Easily print two-sided documents. Using the duplex printing feature, you can help reduce your printing costs and produce two-sided documents, presentations and brochures. USB Direct Interface. Print PDF and JPEG files directly from your USB flash memory drive without connecting to your PC. High capacity replacement toner cartridges. Spend less time replacing supplies and help reduce operating costs by using high yield replacement toner cartridges. Built-in Networking. Featuring built-in wireless 802.11b/g and Ethernet network interfaces, you can easily share the HL-4570CDWT with everyone on your wired or wireless network. 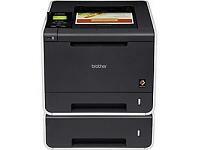 Brother iPrint&Scan. Free app download for wireless printing (JPEG images) from your Android Smartphone (scanning not available).